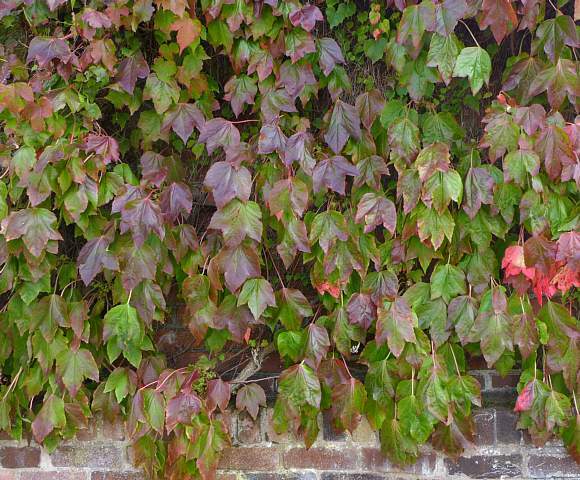 Unlike plants in the same Parthenocissus family, Virginia-Creeper and False Virginia-Creeper with their palmate 5-lobed leaves, Boston Ivy has either simple leaves or 3-lobed leaves. 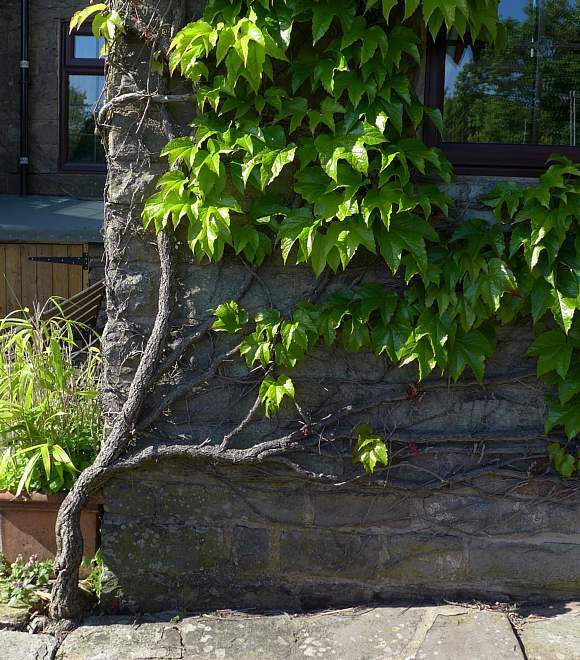 This woody vine can climb walls and trees up to a height of 30m. These leaves seem to be slightly smaller and a slightly different shape (but still 3-lobed) to the previous examples. It is growing up a brick wall. 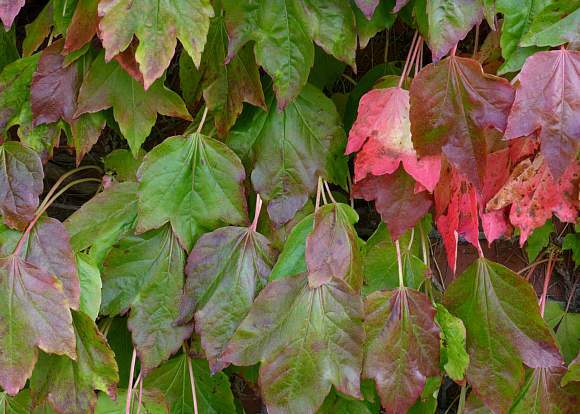 However, the size specification for Boston Ivy leaves is 5cm to 22cm, so all should be well. Leaf size can vary enormously on some specimens (they might be differing cultivations?). 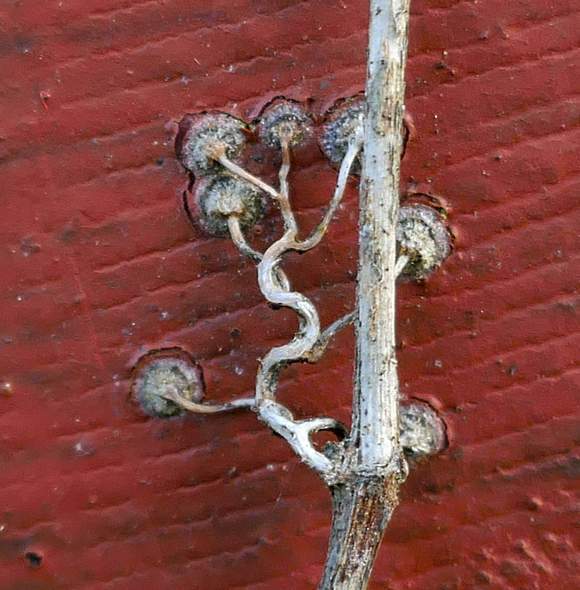 It attaches to the substrate by means of sticky pads which are on the ends of each branch of the tendrils. 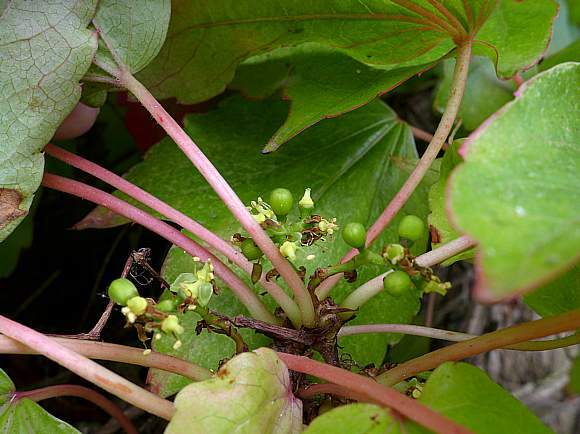 The leaves have a glossy upper surface and are a bright-green, but redden easily in strong sun. 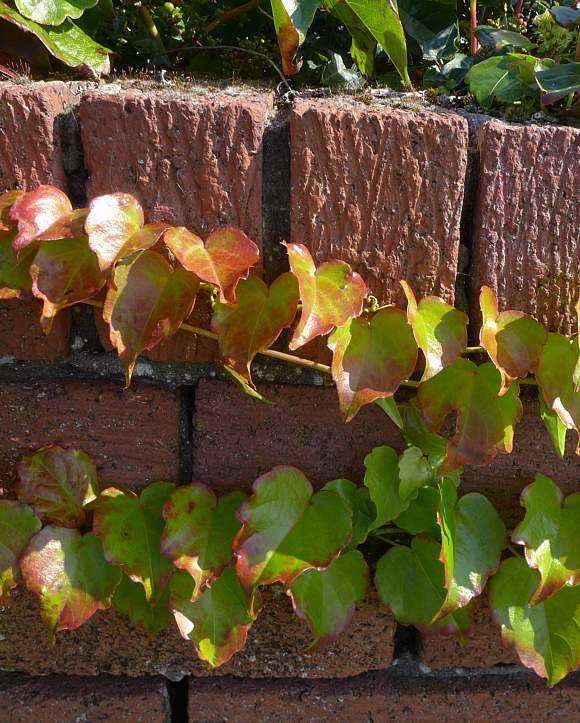 Clinging on to the coarse bricks. 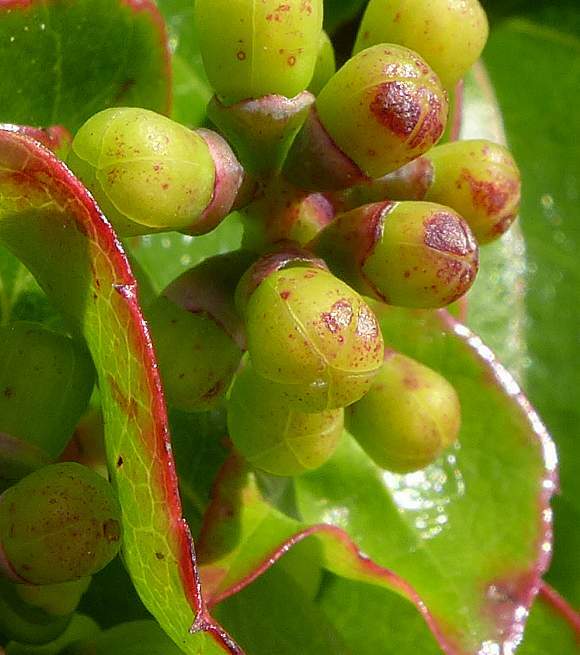 They can be red-edged, or suffused with red. 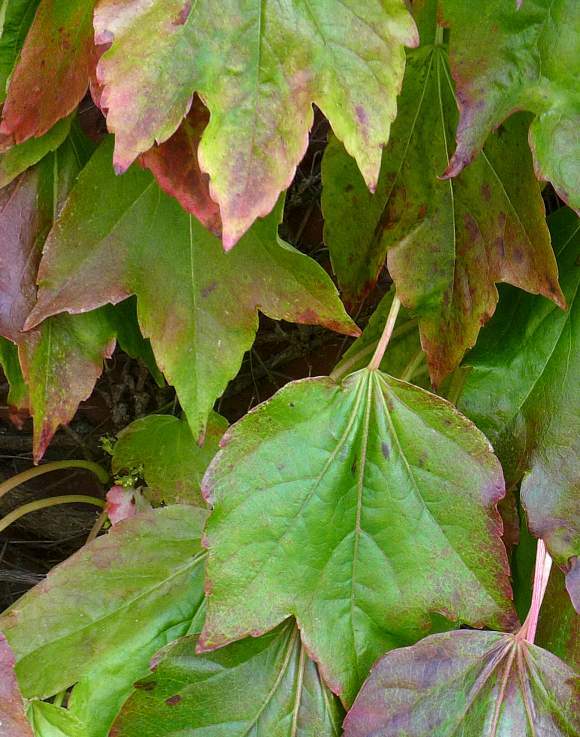 Here some leaves have turned a bright crimson colour. 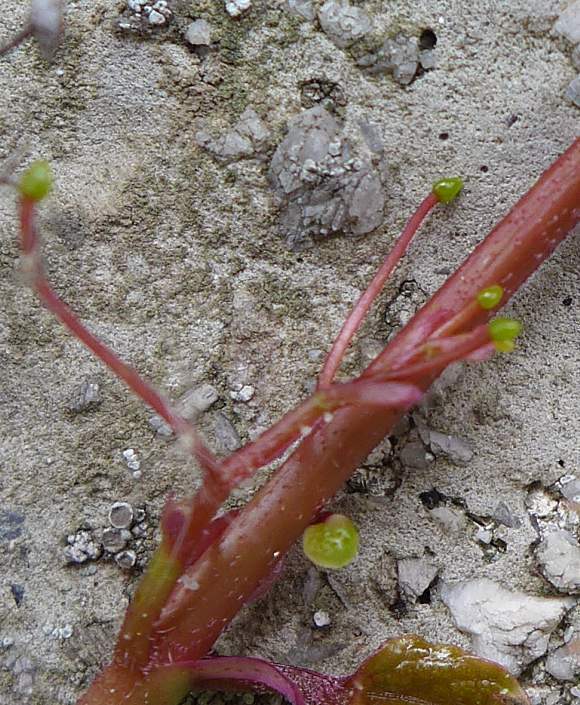 Leaves on long stalks all emerging close together from woody stems. 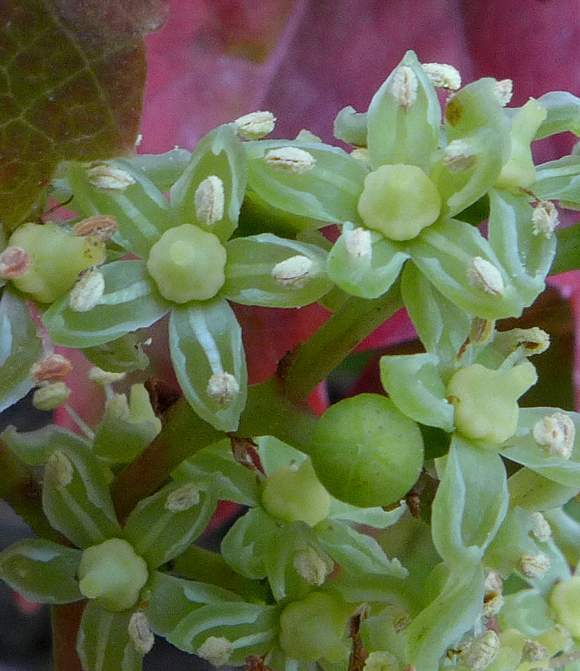 The flowers are tiny (compare the leaf on the left). The network of branches and tendril can be seen close to the brickwork behind. 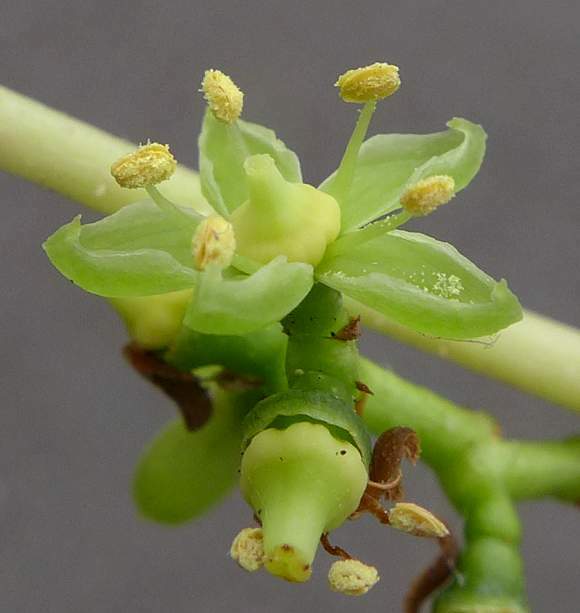 The flowers nominally have 5 petals although some here have but 4. The 5 petals are pale-green. Long stamens lie along the same radial axis as the petals, each tipped by a cream-coloured anther. 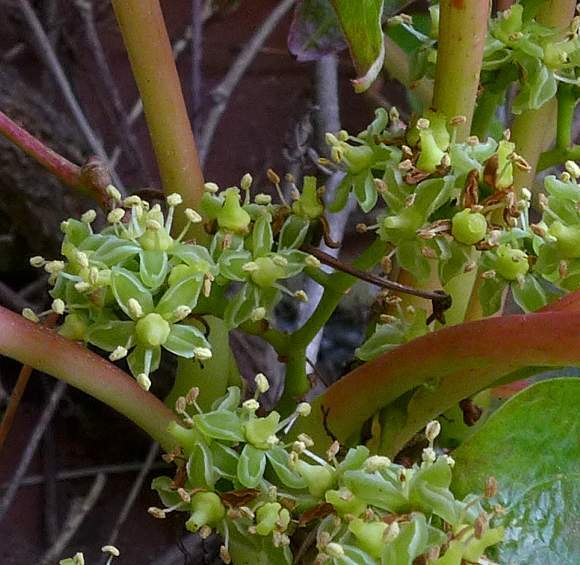 The ovary in the centre is paler-green, slightly 5-lobed and tapers to a round neck, a bit like a laboratory flask or vinegar bottle for the dinner table. Unopened flower bud just right and below centre. 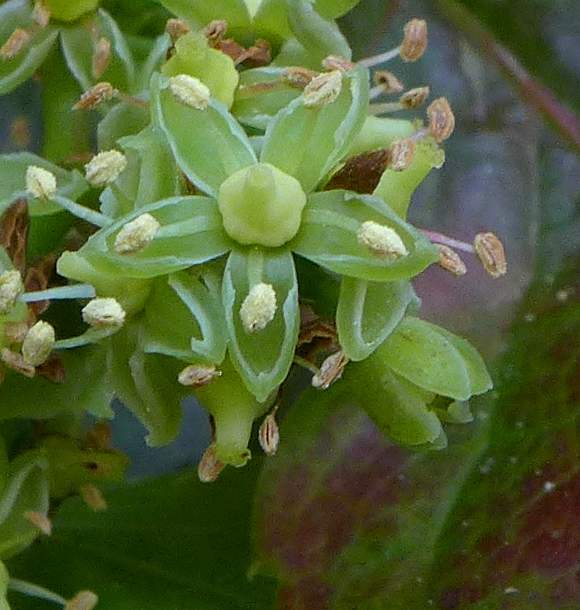 The pale green petals have in-curled irregular white margins, reflecting the shape of the flower-bud. 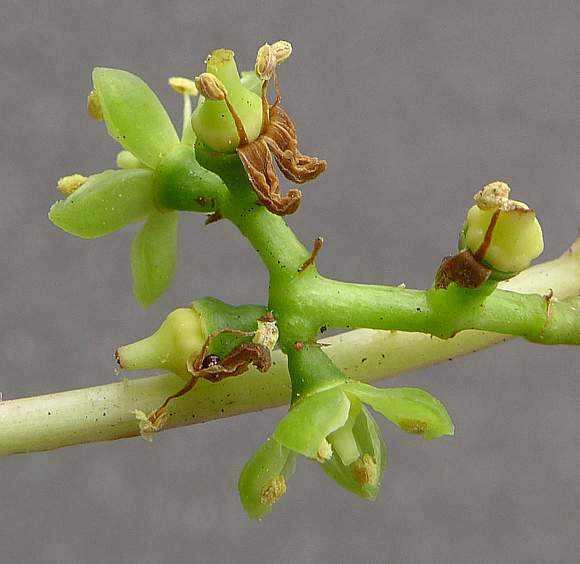 An opened flower, 5 cupped petals with 5 pale green filaments holding large cream-coloured pollen-laden anthers. A developing ovary in the centre which is a more yellowish-green. The ovary from the side (bottom) - the conical sepal cup now has a gap where once the petals were before dropping off as the ovary matures. 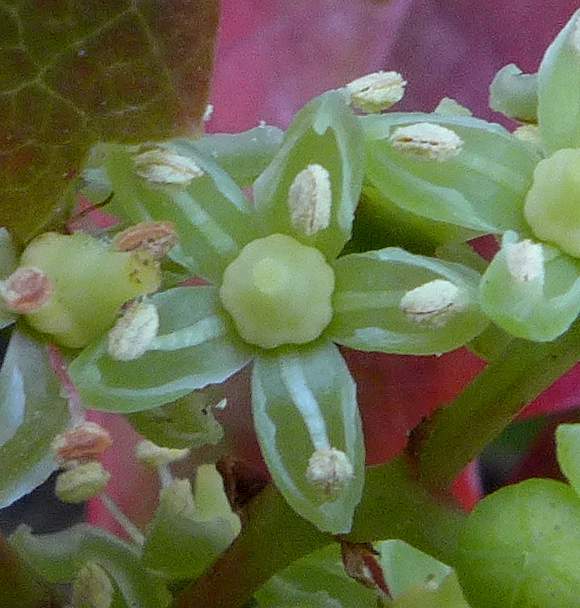 The developing ovaries atop the sepal cup. The stigma is the (here reddish) disc atop the short stubby style on the ovary. As yet unopened flowers. Sepal cup cupping the 5 petals still neatly mitred together at the top. 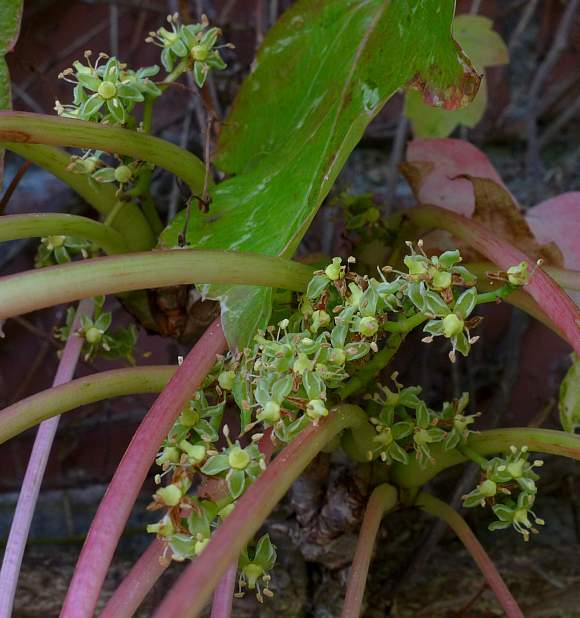 A new shoot with leaves of various stages of growth is sprouting tendrils near the end. 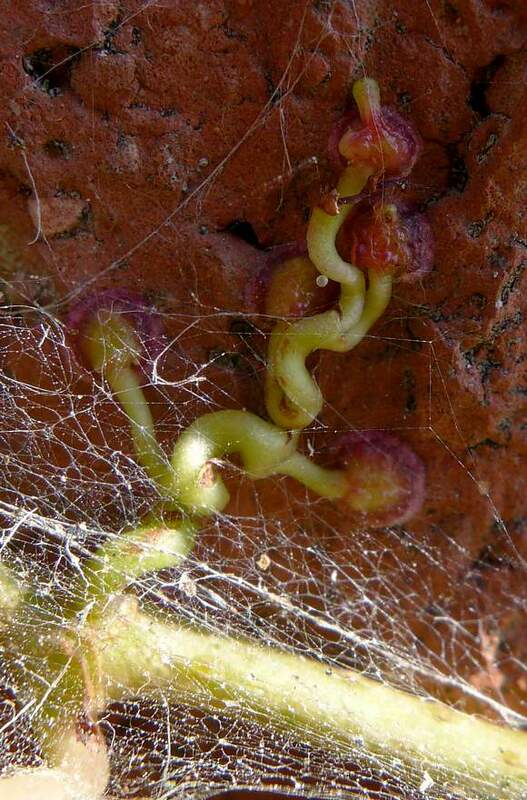 Presumably the ovaloidal green tips on the tendril will eventually develop into sticky discs which will attach themselves to the vertical substrate, enabling the plant to reach 30m in height without getting dizzy spells. 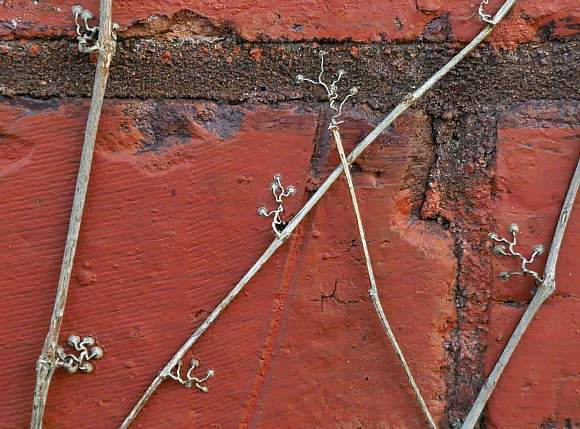 Red discs (not fawn-coloured dead ones) have attached themselves very firmly to the brickwork. 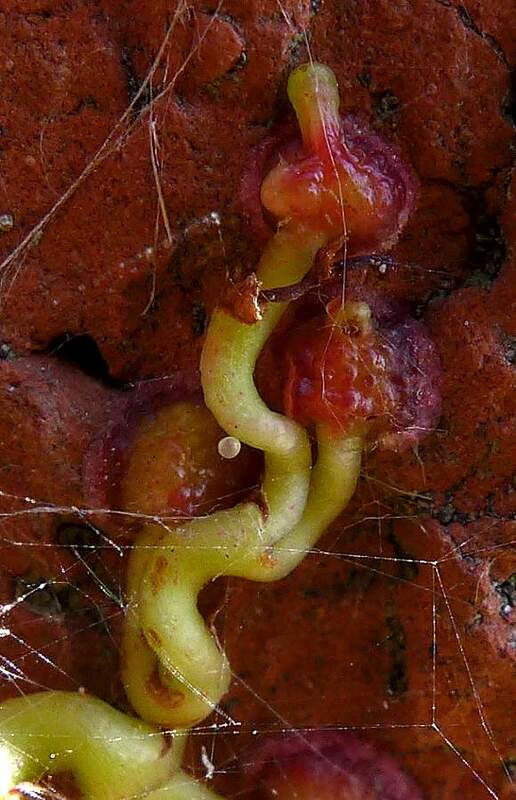 The tendrils leading to the discs are branched. 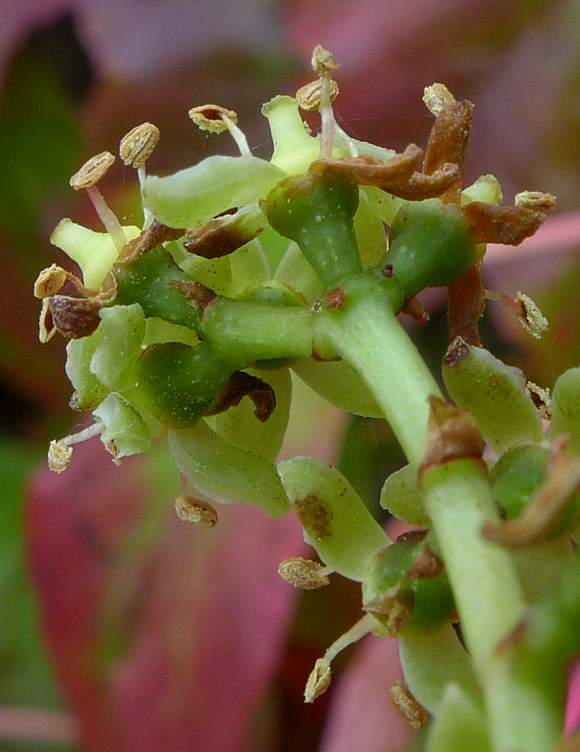 Early in the year when all foliage and inflorescences have gone the tendrils are far easier to see. 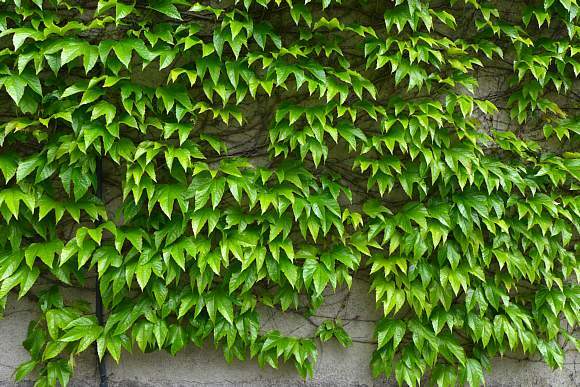 Pulling these plants off the wall will inevitably lead to damage of the wall; such is their tenacity. 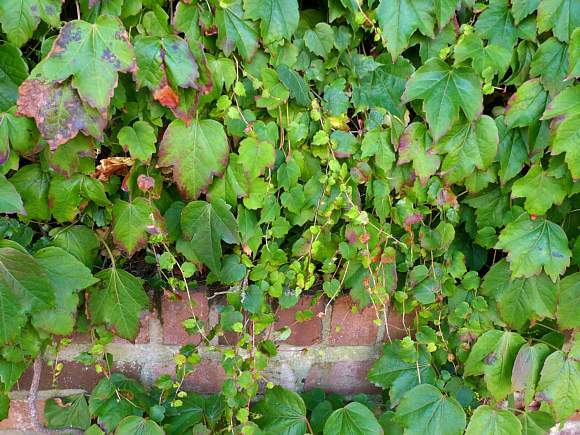 If removal becomes necessary (these plants are notoriously voracious spreaders), then kill the plant first by severing the trunks descending into the ground, leaving for a few weeks for the plant to die before removing. This will limit the damage caused. These specimens look brown, black and dead, both stems and discs. Although most look as if they are dead. 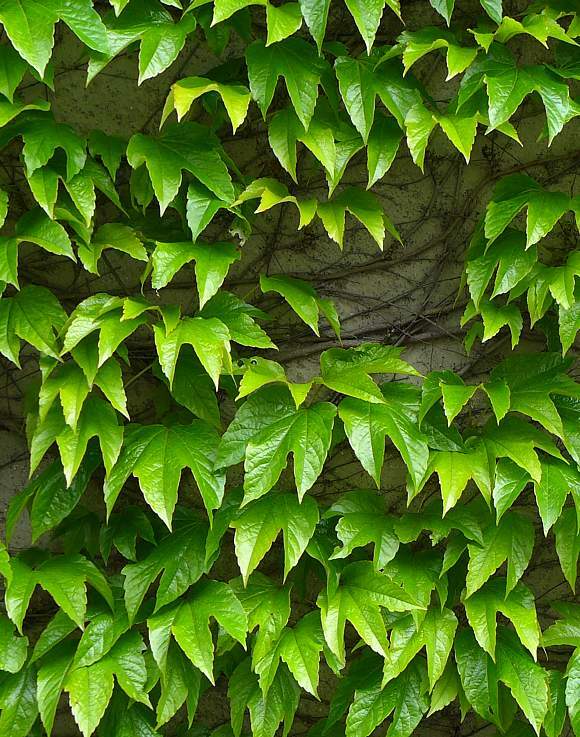 Many similarities to : Virginia-Creeper (Parthenocissus quinquefolia) and False Virginia-Creeper (Parthenocissus inserta) which belong to the same Vitaceae family but have leaves that are usually 5-lobed. 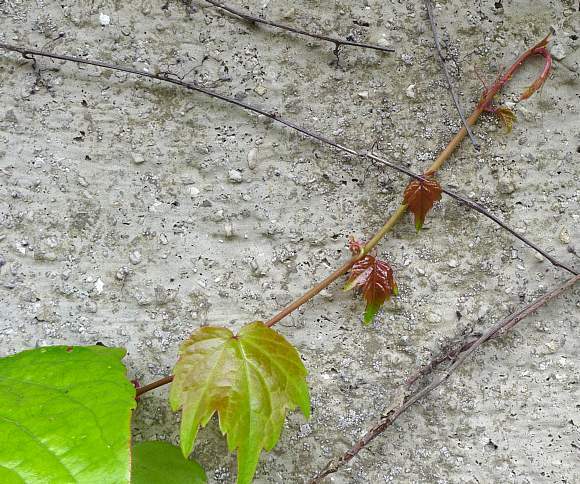 False Virginia-Creeper lacks the sticky discoidal terminations on the ends of the tendril possessed both by Boston Ivy and Virginia-Creeper. 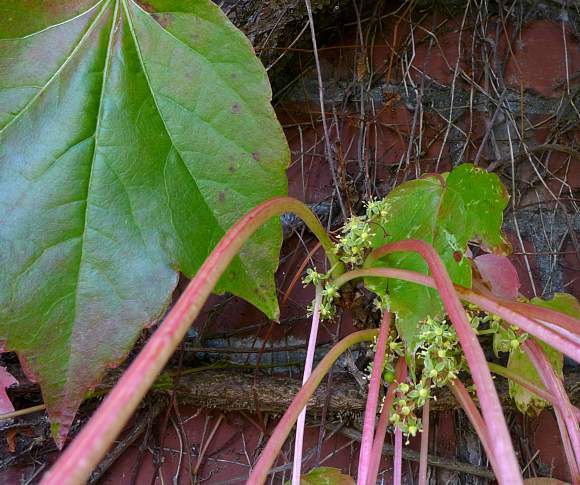 It is a neophyte, grown on tall walls and escapes into the wild to grow in hedges, shrub and old walls. It is very scattered in the British Isles, mostly in the North to the South West. It is native to Eastern Asia such as japan, Korea and parts of China. 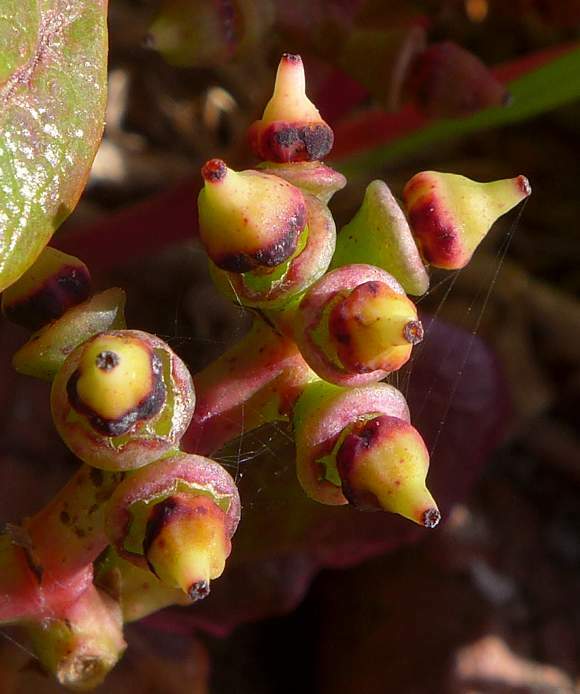 The fruit is bluish-black and a little like a grape, but much smaller, 5 to 10mm across. It is poisonous, containing Oxalic Acid in the form of raphides, very thin needle-like crystals able to easily penetrate individual cells and cause their demise. It is thus a physical poison, rather than a chemical poison.